all in one seamless app. NetRisk™ is a module for NetPoint® that allows you to perform qualitative and quantitative risk analysis. It provides an inherent integration with the planning process, enhanced schedule modeling capabilities, and cost functionality. 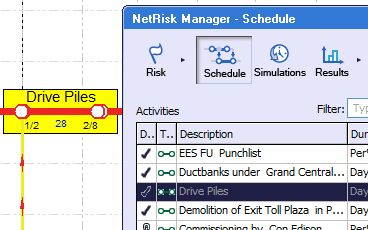 NetRisk™ provides a strategy for identifying and controlling project or program risk and allows risk professionals to bring risk management into the future of project planning. Find project risk resources from our knowledgebase. Model activity-based risk events to better reflect real-world conditions. 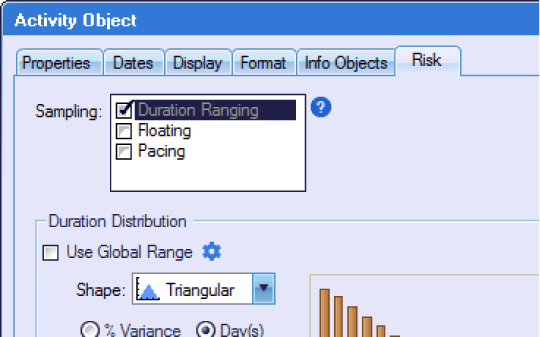 Capture the uncertainty in activity durations and simulate deferred start dates for activities when prescribed float conditions are met. Event that occurs randomly and that involves delaying the start of an eligible activity within its float then-existing when the activity is scheduled. Event that occurs randomly and that involves delaying the start of an eligible activity within its float then-existing when the activity is scheduled, provided the ratio of then-existing float to deterministic float exceeds a specified threshold. Easy to use, yet fully-featured. 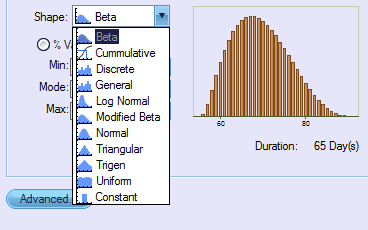 Correlate activity durations and risk likelihoods and impacts, choose from nearly a dozen probability distributions, and run simulations using Monte Carlo or Latin Hypercube sampling methods. Save time entering data and approximate risk in seconds. 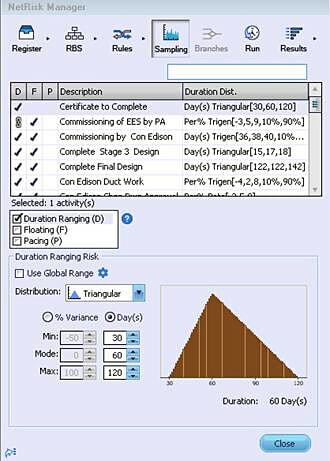 Choose a global distribution shape and corresponding duration range to apply to every activity, run a simulation, and assess approximate schedule risk in a matter of seconds. 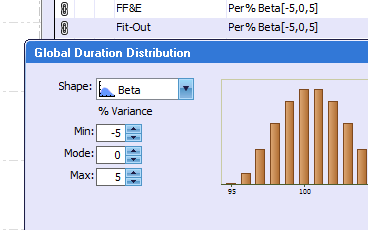 Unique risk-activity impact parameters means never duplicating risk events again. 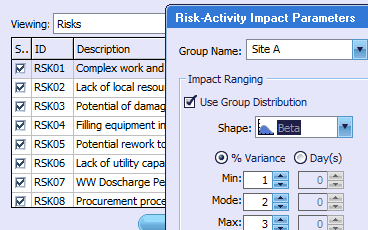 Create and define risk events that can impact different activities with unique degrees of impact and probabilities of occurrence for each risk-activity relationship. Sophisticated tools for analysis and reporting. 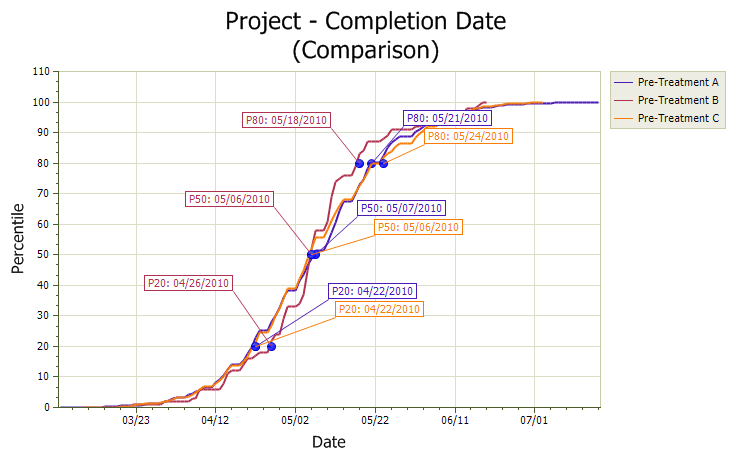 View, customize, and export a variety of charts that compare pre-treatment and post-treatment scenarios, and view the schedule at desired p-values directly on the canvas.